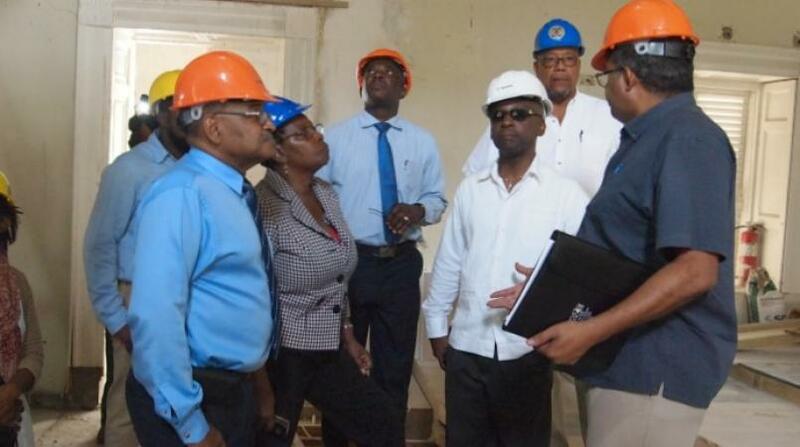 Officials from the Ministry of Culture conducted a progress tour of Queen’s House which houses the Queen’s Park Gallery and the Daphne Joseph Hackett Theater. Minister of Culture, Stephen Lashley spoke to the press following the tour where he revealed the total cost of the renovation work is $5.9 million BDS. The facility was officially opened in 1991 and was then closed down in 2005. Lashley said since that time the Ministry of Culture made paid special attention to the buildings to ensure that restorative work is commenced. He noted the renovations were happening at a critical time in light of the preparations for Carifesta XIII. The regional festival will be held in Barbados on August 17-27, 2017. The building when completed will be outfitted with several modern features including an elevator for access for those in the disabled community as well as male and female dressing rooms. There will also be expansions to the Queen’s Park Gallery. Lashley said the new Queen’s House is testament to government’s dedication to growing the cultural industries. He added the Ministry will be rolling out a maintenance schedule to ensure history does not repeat itself. The work is being headed by CRS Building and Maintenance along with SRM Architect Limited.